Roth offers sealless magnetically driven pumps, which require an NPSHr of only 1 ft (0.30m) FULL CURVE. 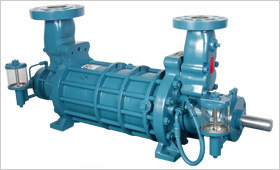 These pumps can produce any level of differential pressure to 1500 ft (457m) (this pressure is 900 ft (274m) greater than centrifugal pumps) and capacities from 4 to 180 GPM (0.91 to 40m3/hr). Construction includes non-magnetic stainless steel or Hastelloy C parts for improved corrosion resistance and improved performance by reducing eddy currents. All bearing surfaces are provided with grooves to provide constant lubrication. 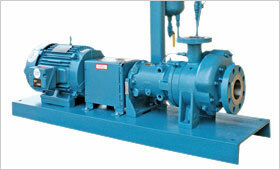 High discharge pressure provides sufficient margin above vapor pressure to insure the fluid being pumped stays in its liquid phase as it passes through the magnetic drive. If you have environmental concerns, consider this pump. Hermetic seal between magnetic coupling and liquid end. Static O-ring or gasket seal between containment shell and pump casing, no external dynamic shaft seal required. High pressure process liquid from the regenerative turbine stage assures liquid phase flush flow through the hydrodynamic bearings. This liquid phase flush flow provides cooling and lubrication for the (alpha grade silicon carbide) hydrodynamic bearings in the drive. Primary containment shell is self venting back to the supply vessel. Standard Magnetic Can: Hastelloy C with 316 Duplex Stainless Steel flange for pressures up to 362 PSI/ 24.9 BAR. High Efficiency Can: for applications requiring more than 25 HP/ 18.6 KW: 316 Stainless Steel (segmented primary containment shell) for pressures up to 660 PSI / 45.5 BAR. M5129SA HF 3 10 197 187 1.05 411.4 24.7 Amb. M5229BSA HF 12 10 197 187 1.05 411.40 24.7 Amb. MD5253SA 3Propylene Oxide 3.2/14.5 0 50-99 50-99 0.83 275/140 1.2-17.8 Amb. M5229BSA VCM 9 25 263 238 0.95 578.72 40 Amb.